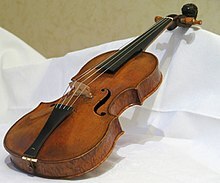 the first [second] violin(s) (オーケストラの)第 1[第 2]バイオリン(奏者). play a piece on the violin バイオリンで曲を弾く. He plays second violin in the X Quartet. 彼は X (弦楽)四重奏団で第 2 バイオリンを弾いている. (music) A musical four-string instrument, generally played with a bow or by plucking the string, with the pitch set by pressing the strings at the appropriate place with the fingers; also any instrument of the violin family. She was looking more like Sherlock Holmes than ever. Slap a dressing-gown on her and give her a violin, and she could have walked straight into Baker Street and no questions asked. The first violin often plays the lead melody lines in a string quartet. (transitive, intransitive) To play on, or as if on, a violin.